PeptoPro® delivers amino acids in the form of di-peptides and tri-peptides. These molecules are so small they need no digestion and can be absorbed quickly by the body for instant delivery to the muscle. 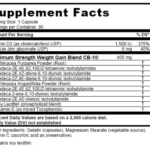 It contains all 20 amino acids needed for muscle protein synthesis. PeptoPro is the first debitterized, hydrolyzed (pre-digested) protein powder made of mostly all di and tri peptides under 300 daltons. In addition, it is the BEST mixing protein powder in existence. So good that PeptoPro actually turns clear when mixed with water. 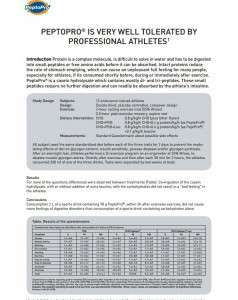 PeptoPro is a casein hydrolysate produced from milk protein. Casein is enzymatically hydrolyzed peptides using a new and patented debitterizing process. This makes it the first hydrolyzed protein that can easily be used in a protein shake. PeptoPro is the best protein powder because it is unique because it contains over 80% peptides that are under 300 daltons. Normal food protein, like whey concentrate or whey isolate, is a polypeptide made up of thousands of units of amino acids. 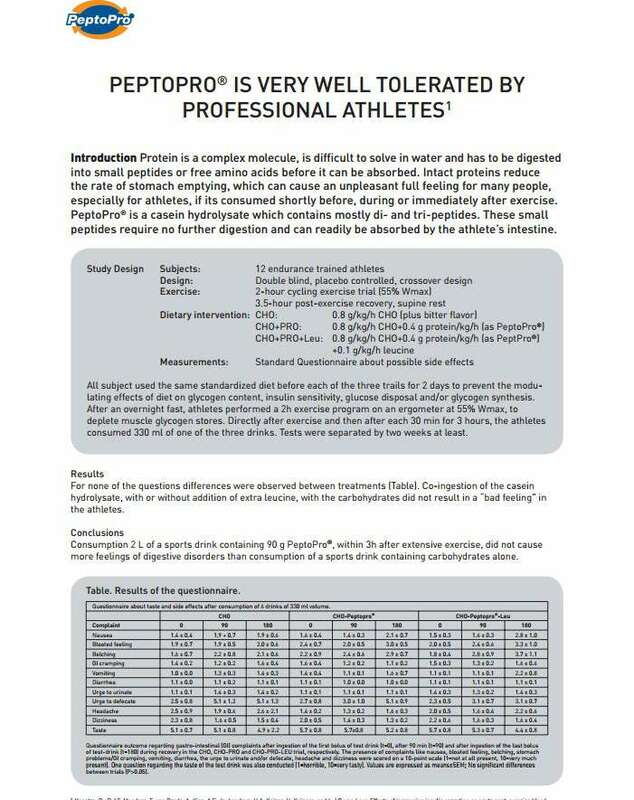 PeptoPro contains only short chain peptides (average length is less than 4 amino acids) which are water soluble. By being water soluble it not only makes the protein more digestible, but most importantly, makes it very user friendly. The small peptides from PeptoPro are directly and quickly taken up by the gut and released into the blood without digestion. PeptoPro, as a casein hydrolysate, is a highly nutritious protein containing all essential amino acids in the correct ration for human health. 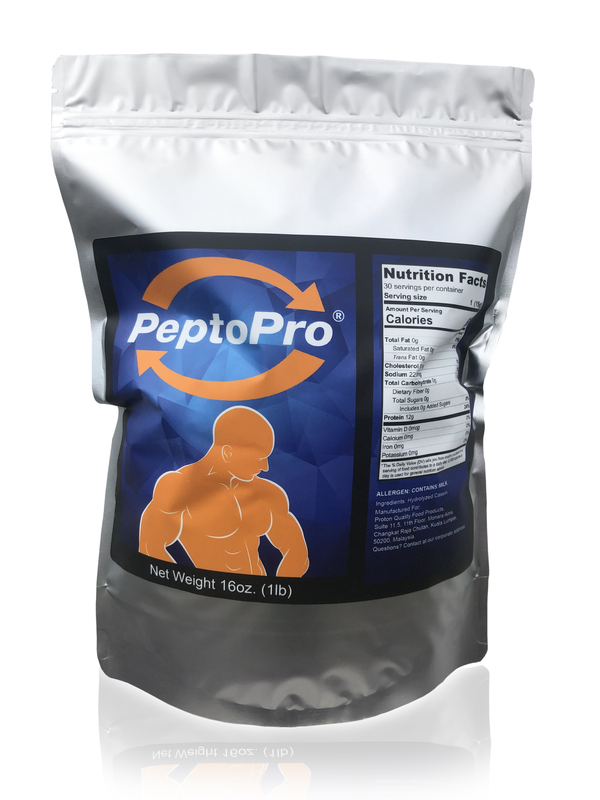 PeptoPro is an easily absorbed protein hydrolysate, which has been treated with proprietary enzymes to cut the protein into di-peptides and tri-peptides, while the well balanced amino acid profile of casein is left intact. PeptoPro eliminates many of the technical problems and physiological side effects held by proteins, protein hydrolysates, and amino acids, while providing all of the advantages provided by these products. PeptoPro is by far THE best protein to use post workout. There isn’t a protein powder or bodybuilding powder that is more effective than PeptoPro. But, it is important to use PeptoPro properly because if not you will experience a very bitter tasting, unenjoyable protein drink. 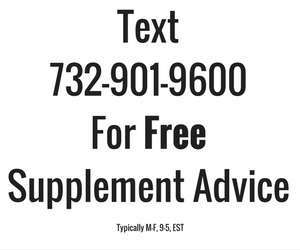 If you weigh about 200lbs you want to use 3 to 5 Tbs of PeptoPro in approximately 24 to 32 oz of a juice type drink. We recommend Gatorade or Powerade. 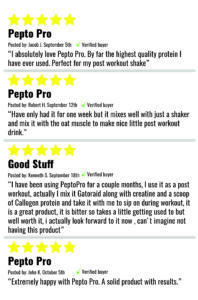 Alex Rogers, President of ProteinFactory.com® personally uses 4 Tbs of Peptopro in 24 oz of Gatorade post workout. Simply add the PeptoPro to the juice drink and gently shake and the PeptoPro will completely dissolve. A blender is NOTneeded. If you use more powder than this amount recommended or less liquid, the drink will become more and more bitter. What you are tasting is the di and tri peptides. If you are using a juice drink that will be enough to flavor the PeptoPro. The only time to flavor the PeptoPro is if you are NOT going to use a flavored beverage. Keep in mind that our flavoring will NOT, we repeat, will NOT take away the bitter taste. How is PeptoPro Protein Manufactured? Starting from milk, the milk fat is removed and the casein is separated by acidifying and filtering from the skimmed milk. Casein is dissolved in water, alkalized and then first hydrolyzed with an endoproteasic enzyme. This produces the typical, but extremely bitter casein hydrolysate with which we are currently familiar. In a second unique hydrolysation step, detailed below, a proprietary enzyme (patent pending), specifically hydrolyses the bitter peptides. In this second step, the PeptoPro casein hydrolysate with its special characteristics is produced. 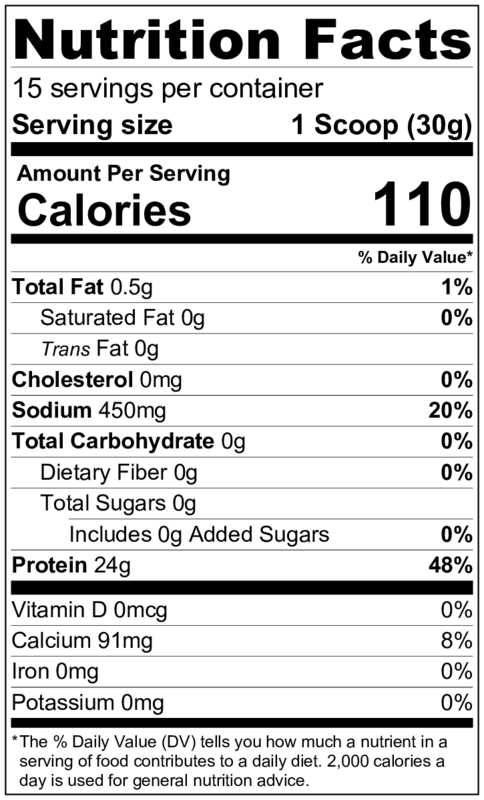 Casein contains a high level of proline. Proline bonds cannot be accurately or effectively cleaved with enzymes currently found on the market. Hydrolysation of casein with normal enzymes forms proline rich peptides (5-10 amino acids) which cannot be further hydrolyzed as no existing commercial enzyme can cleave these proline bonds. Hydrolysation of caseinates with normal enzymes therefore leads to an extremely bitter casein hydrolysate containing many long, proline rich, bitter peptides (green line in HPLC Graph, middle). The bitterness of these Proline rich Peptides is due to the nature of the protein where the Proline is located in the middle of the peptide chain. In the second hydrolysation step, the debittering enzyme specifically hydrolyses the bitter proline rich peptides (blue line, bottom). In this second step the PeptoPro Protein casein hydrolysate with its special characteristics is produced. Ultra filtration removes any residual enzyme, and the hydrolysate is then mildly evaporated, dried and packed. During development, the bitterness of hydrolysates was conducted utilizing 6 professional tasters who were specialized on bitterness. 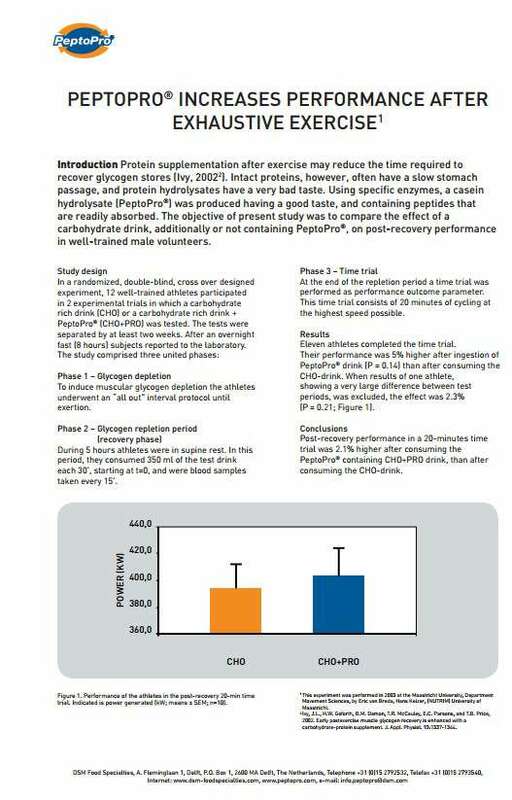 All six said in a double blind procedure that the hydrolysate casein found in PeptoPro Protein tasted far less bitter after the second hydrolysation. 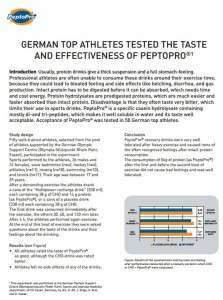 *PeptoPro Protein is officially tested and free of any doping substances. The protein we eat every day are polypeptides and they are too big to be absorbed directly. Our body has to break the proteins down into the single amino acids or into di-and tri- peptides which can be imported into the mucosa cells by peptide importers. Our body can only absorb single amino acids, or di- and tri- peptides. Only single amino acids and di- and tri- peptides are absorbed into the mucosa cells where they are mostly further cut into the 20 single amino acids and then released into the blood, transported and distributed to all our body cells. There is a long discussion going on whether bigger peptides are also partly absorbed and or if di- and tri- peptides are also released into the bloodstream or not. 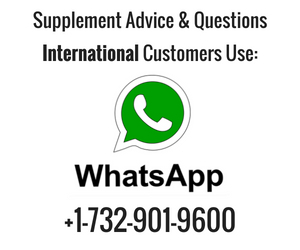 Protein experts today believe that some of the di- and tri- peptides are directly released into the blood stream and that they have some different physiological effects as the intact protein or the free amino acids in our body. 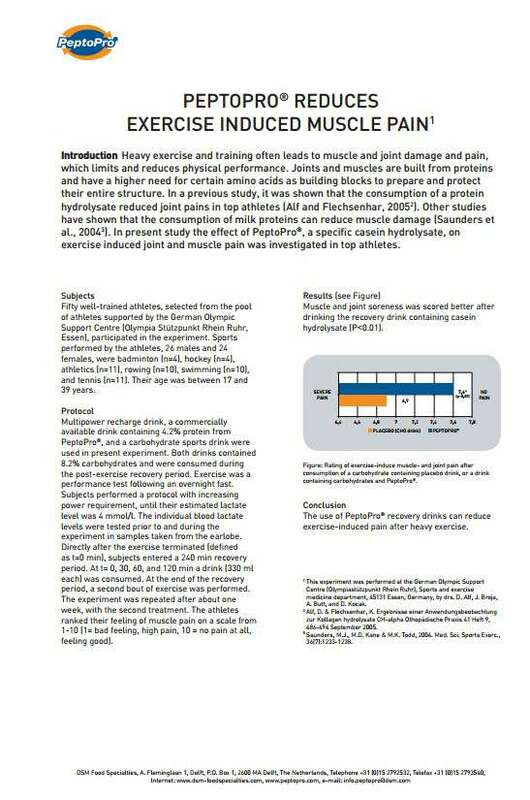 For example the casein hydrolysate in PeptoPro Protein supplies mostly very small an stale di- and tri- peptides. 70-80% of these peptides are smaller than 300 Da and they are directly and fast absorbed by the intestine via specific peptide importers. 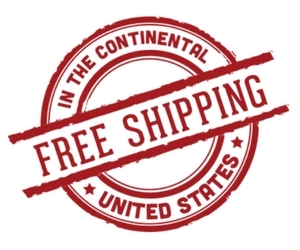 Peptide importers can import directly di- and tri- and maybe some tetra- peptides. It is important to know that peptides (protein hydrolysates) have the same nutritional value than their native proteins, and they have no harmful effects. Peptides are easier and more readily absorbed than intact protein. In clinical practice, the use of hydrolyzed protein is of benefit to terms of the recovery of malnourished patients and of patients with short bowel syndrome. These different effects cannot be explained if all proteins and peptides would end up completely as amino acids in the blood stream. The different effects are more or less indication that part of the peptides are entering the bloodstream as such and that they are causing the different effects dependent on their different structure. A certain portion of the protein we consume is not absorbed by our body but degraded by bacteria in our intestinal tract. Sometimes up to 40% of the consumed protein can disappear during the process. Also, a portion of the absorbed protein which reaches our blood is not used for protein synthesis but for energy production. In that case, the amino acids are transformed into carbohydrates by the gluconeogenesis in the liver. The liver transforms excess amino acids into carbohydrates by the gluconeogensiss in the liver. The liver transforms excess amino acids into glucose (gluconeogenesis) and the nitrogen of the amino acids is turned into ammonia and excreted as urea via the urine. The more nitrogen is found in the urine the more amino acids have been burned for energy production instead of being used for their main purpose, protein synthesis. The lower the nitrogen excretion in the urine, the more amino acids have been used for protein synthesis. This is called nitrogen retention and the higher the nitrogen retention; the more amino acids have been used for building new proteins in our body. Studies from Boza have shown that the nitrogen retention is highest for milk peptides, higher than that from free amino acids or intact protein. That means that the amino acids from milk derived peptides (like PeptoPro) are better and more rapidly absorbed having a higher bioavailability for protein synthesis than amino acids from normal protein and free amino acids. Whether the peptides are absorbed by the mucosa and what the mucosa releases into the blood is still a question. The mucosa cleaves the peptides further into single amino acids and releases them into the blood stream. But if this was always true, all proteins would appear as free amino acids. This would not explain the different metabolic, physiologic and pharmaceutical response of our body to different proteins and peptides. It is more likely that some smaller peptides are entering the blood stream as such and then causing different metabolic reactions. Proteins are very stable compounds that can be cleaved by under chemical conditions such as strong acids and high temperatures but also biologically by specific enzymes called proteases. Our body has to work hard to cleave proteins into smaller molecules. Protein digestion takes time and consumes energy. Some proteins, like casein or red meat, need more time to digest than other resources (for example like egg, fish or chicken protein). Sometimes our body has a reduced ability to digest protein; this is common in people who are ill, in those people with intestinal problems or elderly people with a reduced production of digestive enzyme. 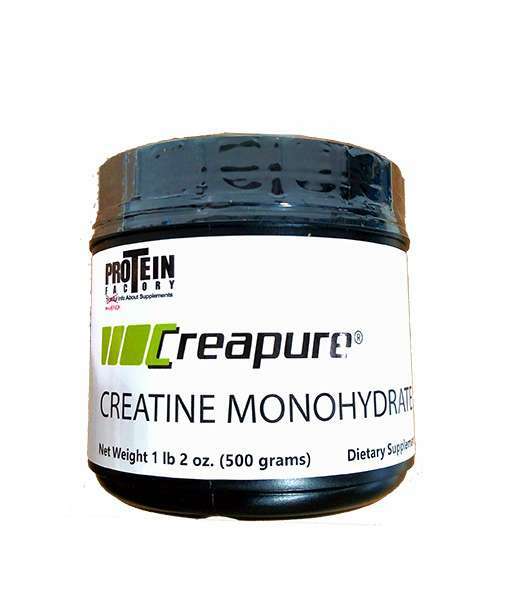 In these cases, an industrially prepared protein hydrolysate offers the advantage that the protein is already cleaved into smaller portions called peptides which are easier and more rapidly absorbed than the whole, intact protein. The speed of absorption is dependent on the size of the peptide in the protein hydrolysate. The more di- and tri-peptides a hydrolysate contains, the faster is the direct uptake of the amino acids/peptides into the body. In industrial production of protein hydrolysates, enzymatic treatment offers advantages over chemical treatment. Chemical modification is not desirable for food applications because of the harsh reaction conditions, non-specific chemical reactions and difficulties when removing residual reagents from end-products. Enzymes, on the other hand, have several advantages, including fast reaction rates at mild conditions and most importantly, high specificity. Hydrolysates had been produced for long time and all companies are mostly using similar enzymes called proteases to cut the protein. Unfortunately all the existing industrial protein hydrolysates taste extremely bitter and have a very unpleasant taste and smell. One of the reason for this was that the most hydrophobic praline bonds could be cleaved by any existing enzyme and that was one of reason that in these hydrolysates a lot of proline rich peptides are formed which are extremely bitter. PeptoPro protein now contains the first patented praline specific enzyme to cleave praline bonds and to destroy the bitter praline peptides. 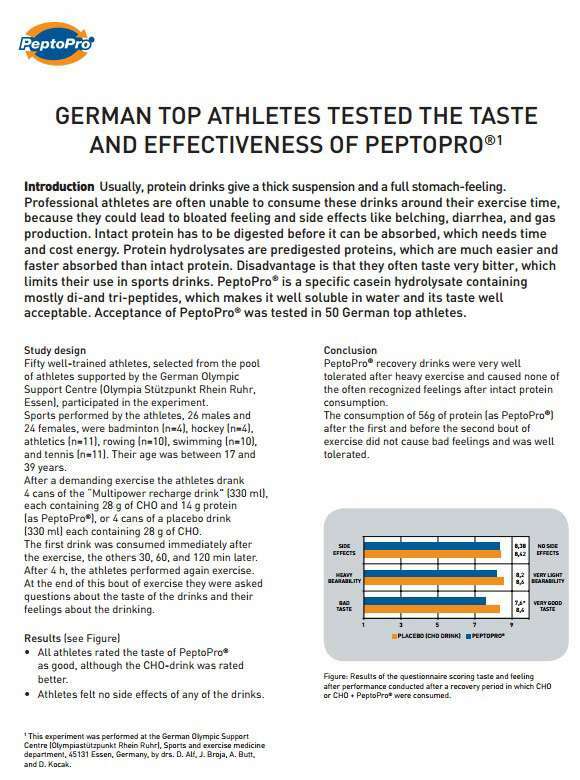 PeptoPro Protein contains the first naturally debittered hydrolysate which has the least bitter taste of all hydrolysates. All enzymes are also proteins or peptides containing various amino acids. For example The proteasic enzyme Chymotrypsin is also a peptide containing 29 amino acids. Its interesting that peptides itself are used to cleave and digest other proteins and peptides. Exoproteases are cutting the whole protein into single amino acids attacking the protein always at the end of the chain. Di- and Tripeptides are cutting the protein also at the end in di- and tripeptides. If an amino acid sequence can not be cleaved by the tri-peptidase, the reaction stops. Tripeptidases are therefore always combined with other enzymes to cut the bonds the di- and tri-peptidases cannot cut, to keep the reaction going. Endoproteases cut always in the middle of a protein after a specific amino acid sequence. The number of pieces you get is dependent on the number of existing amino acid sequences in the protein, which the enzyme is able to cut. Also the time, the amount of the enzyme, temperature and the PH level are influencing the peptide ration in protein hydrolysates. 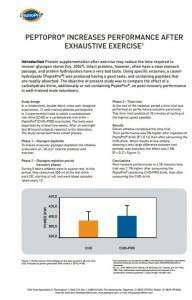 The new enzyme in the hydrolyzed casein reduces the bitterness of casein hydrolysates. 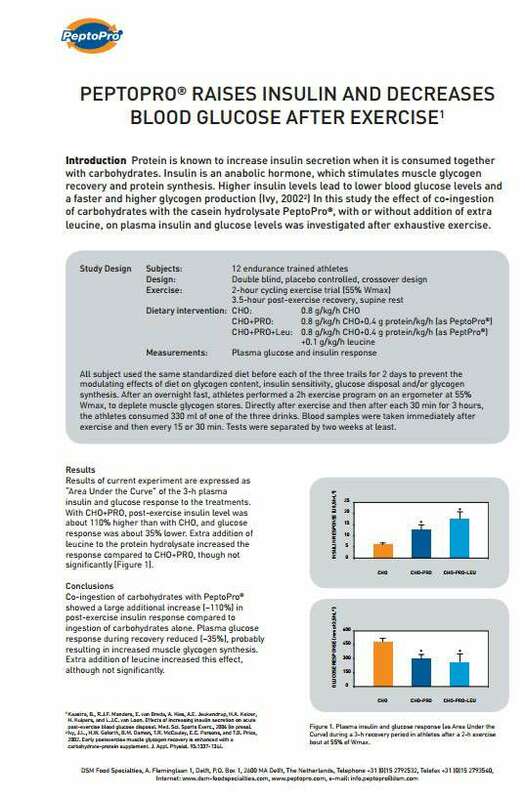 PeptoPro Protein is therefore much lower in bitterness compared to general casein hydrolysates. Get it NOW!!!!. That is all I have to say if you are a fan of protein powders. This is truly the most remarkable protein powder to hit the market in recent years. Everything about this protein says cutting edge, muscle growth, extreme bioavailability, hugely anti-catabolic, and the future of protein powders. Listen, muscle growth is ALL about staying in a positive nitrogen state. All the research is in. We all know that the best time to use protein is pre, during, and post workout. You don’t GROW muscle during your training, you damage it, cause it adds stress, and drops your body into a catabolic state. If you are going to take your body out of a catabolic state and into an ANABOLIC state you need THE FASTEST ABSORBING PROTEIN you can get your hands on. If you are a novice you would use whey protein concentrate, this is O.K. if you focus on leg extensions for quad development. If you have some clue about protein powders you would choose a whey isolate because at least there is NO fat. Now, if you are really serious about making muscle gains you would look for a pre-digested hydrolyzed protein, something like hydrolyzed whey concentrate. These products are very hard to find on the retail shelf. Of course you can find the best ones here at ProteinFactory.com®. Not only that but I have explained to you what to look for in a hydrolyzed protein. Well, now I am going to make you drool. 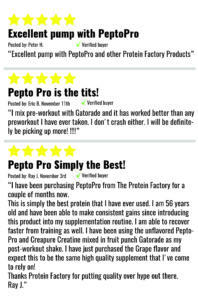 I have gotten my hands on the FASTEST ABSORBING, MOST CUTTING EDGE hydrolyzed protein in the world, PeptoPro. Not only is this the best protein powder, but PeptoPro is a hydrolyzed casein that is absorbed faster, digests better, increases a positive nitrogen state in the body faster, combats catabolism better, and is able to leap tall buildings in a single bound, than ANY OTHER PROTEIN IN THE WORLD. And not only that, but here is the best part for all you girlie men like myself that cant stand the taste of hydrolyzed proteins, PEPTOPRO is the first DEBITTERIZED hydrolyzed protein. I don’t know how they did it, well yes I do, but really PeptoPro RULES!!!! And wait there is more, (wow I am beginning to sound like Tony Little) the mixability of PeptoPro is phenomenal. The protein literally disappears when adding it to water, once again I don’t know how they did it, but they did. It is now the #1 protein for pre, during and post workout, it dwarfs everything else by far. 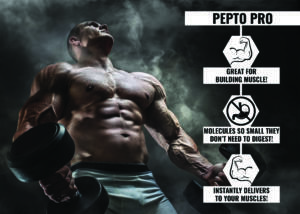 Get PeptoPro now, and experience what this super hydrolyzed protein can do for your muscle goals. 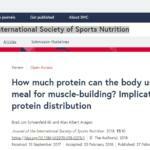 `Does the Best Protein On the Market Exist? Top 5 Greatest Protein Powders of All Time and What I Recommend for Results Now.